Imao® One-Touch fasteners from Fixtureworks® help increase productivity by reducing set up times, eliminating errors in assembly and installation and simplifying procedures. Fixtureworks® (Fraser, MI), a leading North American manufacturer and supplier of clamps, fixturing accessories, machine tool components and rollers & bumpers, now offers a complete lineup of Imao® “One-Touch” fasteners. These pin-and-receptacle fasteners are used to attach fixtures, plates, machine covers and more, joining components with moderate clamping force. A convenient alternative to cumbersome nut-and-bolt assembly, the new One-Touch fasteners provide for quick, easy and secure changeover and installation without the need for any tools. One-Touch fasteners help increase productivity by reducing set up times, eliminating errors in assembly and installation and simplifying procedures. Users that encounter frequent set ups stand to benefit from this efficiency, including food manufacturers where equipment is regularly disassembled for cleaning as well as other manufacturers that often reconfigure production equipment. More specifically, One-Touch fasteners may be used in automation to attach conveyors, star wheels, guide plates, shooters, pushers, handling machine chucks, rotary blades and maintenance covers on machines, to name just a few applications. The Imao One-Touch fasteners are available in quarter-turn, knob-locking, button-locking, ball-lock clamping and magnet-lock clamping pins styles. The quarter-turn clamps provide on/off position easily, high tensile strength with locating repeatability to +/- 0.1 mm. The knob-locking clamps are easy to use and offer secure clamping. 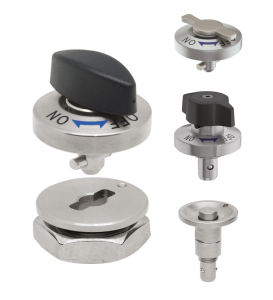 The button-locking pin series, made of stainless steel, securely locks and then releases with a press of a button. Ideal for tight workspaces, the clamping pins and magnet lock clamping pins with receptacles offer compact and safe locking. The quarter-turn clamps come with either a plastic knob, metal knob or low-profile knob to provide flexibility for fastening operations. The bodies are made of nickel-plated steel while the pin is stainless. The plastic knob is fiberglass, and the fastener can provide clamping force to 66.3 ft/lbs. Similarly, the knob-locking clamps have a nickel-plated body with a fiberglass knob. The ball and spring are made of stainless steel. These types of fasteners can provide clamping force to 36.8 ft/lbs. Button locking pin clamps come in one of two bodies, nickel-plated and stainless steel. The button is made of either nickel-plated steel, stainless steel or steel. The units provide clamping force to 36.8 ft/lbs. The ball-lock and magnet lock clamping pins come with a wrench for installation and removal. The bodies are made of nickel-plated steel, the balls and springs stainless steel. The magnet is neodymium. The clamping force for the ball lock style is up to 11 ft/lbs, while the force for the magnetic clamp style is up to 5.16 ft/lbs. handles, knobs and handwheels; Imao® clamps, mini-clamps, supports and stops, risers, T-nuts, sliding mounts, springs grid plates and blocks; OK-Vise® single and double wedge clamp designs; and Modern Industries mPower™ product line which includes quick change precision locating and mounting systems and modular tooling, plates and columns.